As of 2015, it has a population of 127,857 inhabitants over an area of 1,499.71 square kilometres (579.04 sq mi), giving it a population density of 85.25 people per square kilometer. The provincial president was Salvatore Cherchi. It had two provincial capitals, Carbonia and Iglesias, with populations of 29,007 and 27,332 as of 2015, respectively. Colonies in the province were established by the Phoenicians and Carthaginians in the 9th or 8th centuries BC. Its mining industry developed during the nineteenth century due to its barium, copper, lead, silver and zinc deposits, but this industry fell into decline after World War II. It was formed in 2001 by a Sardinian regional law and became functional in 2005. On 6 May 2012 the regional referendums of Sardinia took place regarding the abolition of certain provinces and a variety of other matters. The suggestion of reforming or abolishing certain provinces in Sardinia was approved by the Regional Council of Sardinia on 24 May 2012. Due to this, the province of Carbonia-Iglesias was ordered to form a new administrative body or be abolished on 1 March 2013, but this expiry date for constitutional changes was extended to 1 July 2013. It has not been abolished as a regional law regarding it has not yet been created. ^ a b c "Province of Carbonia-Iglesias". Italia.it. Retrieved 18 August 2015. ^ a b "Provincia di Carbonia-Iglesias". Tutt Italia. Retrieved 18 August 2015. ^ "Referendum". 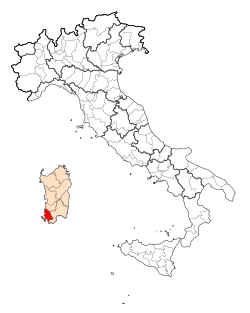 Autonomous Region of Sardinia. 25 May 2012. Archived from the original on 8 May 2012. Retrieved 18 August 2015. ^ "Provinces alive for another nine months, the Council approves the law". Radio Press. Archived from the original on 26 May 2012. Retrieved 18 August 2015. ^ "Provinces begin the countdown". L'Unione Sarda. Retrieved 18 August 2015. ^ "Provinces: all out in nine months". La Nuova Sardegna. 25 May 2012. Retrieved 18 August 2015. This page was last edited on 11 December 2018, at 23:58 (UTC).